The Kia Sportage was all-new last year, and Kia has set to enhancing its subcompact-crossover SUV with upgrades to help it keep up with competitors like the Honda CR-V, Toyota RAV4 and Ford Escape. New this year is a technology package for LX models that adds blind-spot detection and lane-departure warning, while the EX now gets those features and more standard. The Kia Sportage: a fashionable approach to safety. The Kia Sportage is a reliable vehicle with a number of great features, including a built-in GPS system, a high-quality stereo system, climate control front seats, an adjustable sunroof, and ample trunk space. The vehicle is comfortable to drive, with an easy-to-adjust driver's seat and accessible controls. The Sportage features many important safety features which can detect nearby vehicles and pedestrians and detect lane changes and oncoming traffic. A rear backup camera is included as well. In addition to front and side airbags, the vehicle includes a rollover sensor and a brake assist system. Features such as the automatic trunk door make grocery shopping a breeze. The interior is high-quality, comfortable, and durable, featuring adjustable seating, cup holders, and even a USB port to charge your mobile devices. With up to 30 miles per gallon, the Sportage is relatively efficient for a vehicle of its kind. 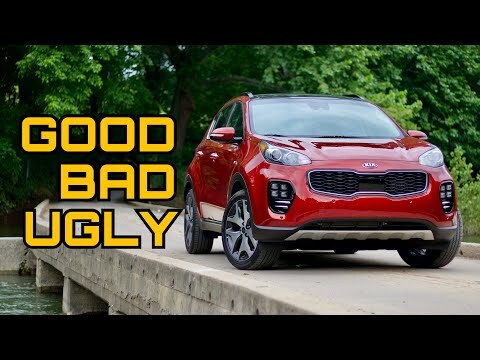 Overall, the Kia Sportage is a safe, efficient, and reliable vehicle. I absolutely love my 2018 Kia Sportage. It's the perfect size for a small family or family that has pets. The backseat is really roomy and the trunk has plenty of space. I love the rear view camera and how it helps when backing up or parking especially since the busy of the car is wide. The Sportage is also fairly good on gas, I believe since it is 4 cylinders. I have had the car for over a year and haven't had any problems yet. The AWD is amazing in the snow and you do not feel like you are sliding all around while driving. I do wish that the emergency brake was in the middle like other cars. Overall the Sportage is amazing, comfortable seats, good on gas, smooth ride and has a lot of easy buttons and pictures to make handling it a lot easier. I would definitely recommend this car to anyone and I look forward to owning another Kia in the future! Kia Sportage Panoramic moonroof. Heated seats and steering wheel. I love my Kia Sportage. I got it because I had a Kia Forte and love Kia. The dealership was spectacular and extremely helpful. I have a great car. Great gas mileage all the time. It has heated seats and steering wheel. I can plug my iPhone in and it hooks up to my stereo so I am hands free to text (speaking) and call anyone. I just took in for an oil change and have a service plan so tires are rotated and am liking the ease of car. I have driven in winter and it works great as well. I will buy another Kia next time.